New York : Scribner, 2008. A half-starved young Russian man claiming to be a devout Muslim, an idealistic young German civil rights lawyer, and a sixty-year-old scion of a failing British bank based in Hamburg form an unlikely alliance as the rival spies of Germany, England and America scent a sure kill in the "War on Terror," and converge upon the innocents. Not one of Le Carre's best. It's a simplified reworking of several themes that he's covered before. Unfortunately they don't benefit from the simplified treatment. We have the usual innocent (ish) runaway, pursued by the world's security forces; the naive bystanders eager to help the poor waif; and the corrupted agents trying to do the best they can in the world - holding off the combined forces of evil represented by their competing Agencies and the bad terrorists. There's a pretty girl and an attracted man, and a small town in Germany. (well OK it's set in Hamburg, but it is such a generic Hamburg that it could be anywhere.) You can guess all the rest quite clearly. It is again another screed bemoaning the overreaching US led anti-terror security forces. It's a short book (fro LeCarre) The characters are thin for Le Carre, the action also repressed, and the descriptions terse. None of this plays to his strengths. The slow plot meanders it way to the inevitable conclusions, without any of the twists, turns, mis-directions, or sheer personalities that Le Carre has inspired in his more memorable works. While A Most Wanted Man was a well written page turner it lacked the complexity I have come to love in Le Carré’s novels. Published in 2009 it was topical and I suspect it was the author’s way of bringing the practice of extraordinary rendition carried out by governments that keep quite about what they are doing and, when their actions are exposed, justify everything under the banner, “The War on Terrorism”. Le Carré gives the reader a glimpse of the shady world of international counter espionage and the pervasive nature of modern surveillance. 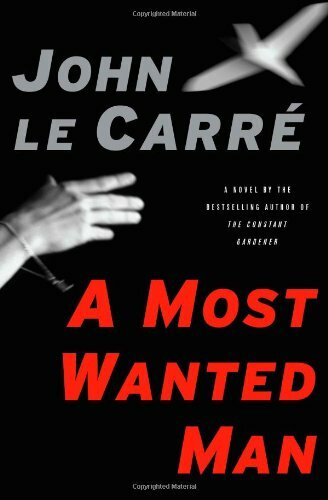 A Most Wanted Man is a spy novel extraordaire with themes more relevant to today's issues then most other thrillers I've read. Highlighting the war on terror and they way it has altered rationality, this is a book that should hit close to home for anyone. Issa, a young Russian with horrific scars, comes mysteriously to be in Hamberg. A devout Muslim, he is quickly under suspcion from all sides. Annabel, a young German lawyer is determind to prevent the government from deporting him and she drags a wealthy British banker into her cause. It's a game of cat and mouse as the rival spies try to find proof of Issa's terrorist connections. Issa arrived in Germany with no past and access to large money. He didn't want the money as it was gained immorally according the the laws of Islam. The story unravels his past, and who he is, without providing a lot of definite answers. Issa is studied by several teams, oftenwith different interpretations of the past. This book is set in Germany, near the current time. It involves current issues, and feels typical for Le Carre's work. I gave up on this book after 100 pages. Nothing happened except the author introducing some rather dull characters. There seemed to be little at stake for any of these folks. Basing a book on the flimsy "war on terror" is probably not a good idea. John Le Carre turns his still considerable literary and story-telling talents to the `war on terror' in his latest work. Set in Germany, a middle-aged ex-pat English private banker and a young idealistic left-wing lawyer form an unlikely alliance to help a somewhat mysterious illegal Chechen Muslim refugee when he turns up in ill-fated Hamburg. The Chechen has come to claim `black' bank account from the British banker with the aid of the lawyer. Their efforts quickly come under the eye of various counter-intelligence agencies: German, British, and US. Each agency has its own agenda in dealing with the trio. Le Carre does a nice job describing the nuances of the agencies' various modes, motivations, and interactions. One group of German agents, the good cops, wants to use the banker, the lawyer, and the Chechen (and the Chechen's money) to compromise and turn a prominent Muslim doctor with suspicious ties. The others, especially the Americans, have other ideas. Le Carre also creates an intriguing ambiguity as to who or what the Chechen really is. Is he a terrorist? A hapless victim? Likewise, with regard to Dr. Abdullah - is he a legitimate conduit for channeling money to leading Muslim charities or is he knowingly directing part of the funds to nefarious ends? I found the story less than compelling at times - in a word, put-down-able (if that is a word). The motivations of the banker and to a lesser extent, the lawyer to take huge risks are not entirely convincing. But then LeCarre has never really produced page-turners. I've always been interested in why Le Carre is so popular. That's not to denigrate his writing, but rather to suggest that his books seem too slow, too serious, too English to consistently feature in best-seller lists. I'm also interested in what seems to be his shift to the left in recent novels. Here he offers a critique of the current 'war on terror', showing how the innocent are victimised, how the vaguely threatening are turned into global pariahs and the ethical are marginalised. I'm not sure he's offering a genuinely leftist critique of current US-British policy so much as a lament for the passing of old-style liberal espionage, but its good to see such a popular author challenging what's going on. This troubling story deals with the limits of modern spy craft as it applies to finding and bringing terrorists to justice. Innocent people are falsely accused and the cascade of frightening events sweep others into a snare set by a multi-national anti-terrorist team. A page-turner, as most of his books. Very good overall but mixed feelings about this book. Obviously, this is probably the best le Carré since The constant gardener. It is even getting close to the depth of his older works sometimes - but this comparison with the masterpieces of le Carré is a bit tedious, isn't it? Whats is interesting and disappointing at the same time here is the cynism of the author and the lack of events in the novel. Where one would expect some thrilling and somewhat unbilievable spy story, it is a more realistic account of possible truth - hence being a bit more dull. Masterful as ever, but the end was appalling - up to the last I was hoping for a positive twist, but should have known better - I was shattered by the ending. Solid spy thriller with a nice mix of mysterious characters from Chechens and Russians to a number of agents with the usual inter-agencies' rivalries. In the end though, the real villains turn out to be much more familiar. Good writing and pacing; lousy politics. John le Carre bases A Most Wanted Man on a most unlikely premise. To depict the extent of Western xenophobia and scapegoating spawned by 9/11, he chooses to set this spy novel not in the country that was struck by the terrorists, or in the nations targeted by the ensuing War on Terror, but in the country that served as a way station for several key 9/11 terrorists. Hamburg, Germany, a city known for its openness to foreigners, is infiltrated by a fractured young man from Chechnya who may (or may not) pose the next grave threat to Western civilization. Young Issa's improbable entry into Germany, tenuous connection to Islamic radicals, and inherited right to a large secret bank account held by British-owned Brue Freres, place him in the crosshairs of German, British and United States intelligence agencies, each with its own mysterious agenda. When young civil rights attorney Annabel petitions bank owner Tommy Brue to release the secret funds and help protect Issa from deportation, Annabel and Tommy find themselves caught up in a multi-layered plot that tests their willingness to sacrifice their reputations and livelihoods for the benefit of this enigmatic young man.